‘Tradition is the continuity through which we know ourselves’– Iram Zia Raja. Where did you train to be a textile designer? I attended the National College of Arts , where I trained to be a textile designer. I have also been teaching there for 23 years now and have been heading the Design Department for the past 10 years. How did you transition into jewelry? I started designing jewelry 12 years ago actually and started with gold. Soon after I was made Head of the Textile Department that increased my administrative workload. I have exhibited over the years but upon streamlining my professional commitments I got back into designing jewelry. Where all have you exhibited? I have exhibited at Canvas Art Gallery in Karachi several times. I also exhibited in New York. Last month I exhibited in Dubai. This time I exhibit in Lahore and I am very excited about it. Every medium has its own sensibilities. Every metal is unique, whether its gold, silver or copper. When I exhibited in New York, my pieces were made of copper, which has its own unique colour and feel. Gold is great but is expensive and the piece must be crafted perfectly, which is obviously a little difficult to get right in the first go. Silver, I believe is a very wearable metal. It compliments our skin tone and is great for daily wear as it’s light and looks great with a range of stones and colours. We have a long summer and silver jewelry is great to wear in this hot season. You can’t substitute one metal for the other. What is the inspiration for this collection? This collection is my ode to Lahore. I derive my inspiration from colonial and Mughal architecture. I am also very inspired by Data Darbar and Mian Mir’s Darbar, the former I used to frequent as a child with my father. I also derive my inspiration from the people and even the trees of Lahore. So it would be safe to say that your exhibition is a living tribute to Lahore? Yes, absolutely! I am a Lahori through and through. I was born here, I grew up here, I went to university here, I got married and started both my career and family here. My many years spent in Lahore are a constant source of inspiration for me. What should we expect from the collection your upcoming exhibition? We have pendants, earrings, bangles and a few rings that we are exhibiting this time around. 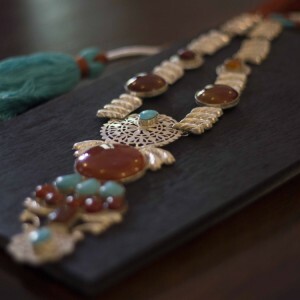 Each piece of jewelry has within it an element of Lahore- from the use of ‘jalis’ in traditional buildings, both colonial and Mughal to the trees in Lahore. Having been trained in design, I am able to design the jewelry in a manner that is both unique and wearable. What response are you expecting from the Lahori market? Lahore has a varied market and I believe my collection will appeal to Lahore. I am confident that every single design will charm Lahore and this I can tell you from my experience and exhibiting to various audiences. My exhibitions in Karachi are sold out and I am confident that Lahore will appreciate my designs as well. As an artist, you essentially put out a piece of yourself when you display or sell your work. What commercial considerations play a part in the creative process? I am the harshest critic of my own work. The design is conceived on paper and is re-sketched till it is exactly as I envision it. The craftsman then makes it, which is also a grueling process as the tiniest mistake on their part can significantly effect the final product. I tell my craftsmen that since my name is attached to each piece, it must be perfect. This is how commercial considerations play a part in my creative process. I am confident about my designs. It is also being able to produce a high quality product that the consumer will not only like but would come back for more. Out of the 150 designs that were actually conceived I am displaying 75 of them. Usually when volume is increased, quality suffers. I do not lacquer my silver jewelry. I want my client, new or old, to have faith in the quality of my product. Silver oxidizes with time and when my jewelry oxidizes it is testament to my customer that the product I am selling is pure silver. You focus a lot on tradition. How important is tradition in design? I have been trained at a modern art school and over the years and with experience I have learnt to appreciate traditional forms more and more, so much so, that I incorporate traditional elements in my work. Tradition is my teacher. Without following tradition one cannot hope to innovate as innovation itself finds its basis in tradition. Tradition is the continuity through which we know ourselves.